Dicetopia is a challenging and quick strategy game for 2-4 players with a playtime of 30 minutes. The game introduces a fresh mix of area control, worker placement and secret objectives. On players turn they will deploy one of their agents to a neighbourhood in the city. This single move will all at the same time determine which area they will try to control, what resource they’ll collect and what action they’ll perform. The ultimate goal is to score the highest points based on the neighbourhoods players dominates, the die resources they have, and from their secret missions. 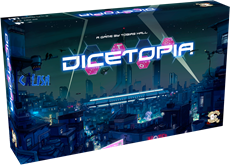 You can help make Dicetopia a reality by supporting it on Kickstarter!